On Monday, March West Texas Intermediate (WTI) crude futures plummeted $1.68, or 3.13%, to $52.02 per barrel on the New York Mercantile Exchange. Although it has surged more than 12% so far this year, crude prices recorded a 3% decline last week. The steep losses reflected market concerns regarding supply outpacing demand. The latest Baker Hughes total oil rig count added 10 to 862. The US Energy Information Administration (EIA) reported that domestic crude inventories surged eight million barrels to a two-week high. The EIA also released its “Annual Energy Outlook 2019” report and forecast that US production will top 14 million barrels per day in the next couple of years and continue that way until at least 2027. The overthrow of Venezuelan President Nicolas Maduro has further dominated global crude news. On the data front, weaker-than-expected numbers are leaving investors with the belief that the Canadian economy will suffer a slowdown. Existing home sales fell 2.5% last month, November retail sales slipped 0.9%, core inflation was unchanged at 1.7%, factory sales slumped 1.4%, and wholesale trade slid 1%. According to the Bank of Canada (BOC), which revealed last week that any future increases to interest rates depend on the data, tumbling oil prices and a cooling housing market would negatively affect the economy in the fourth quarter of 2018 and the first quarter of 2019. BOC Governor Stephen Poloz does think borrowing costs will climb higher, adding that the economy remains in a “steady state,” and rates should follow the same path. 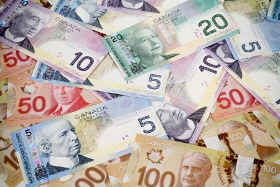 The USD/CAD currency pair rose 0.44% to 1.3276, from an opening of 1.3217, at 14:14 GMT on Monday. The EUR/CAD surged 0.71% to 1.5182, from an opening of 1.5075.